WASHINGTON (CNS) — The various communities marched in one by one, neatly filing in with a different statue of Mary in her various manifestations as Our Lady of Antipolo, Our Lady of La Vang, Our Lady of Samoa and the golden Our Lady of Good Health, Vailankanni, as she is known among Catholic communities in India. 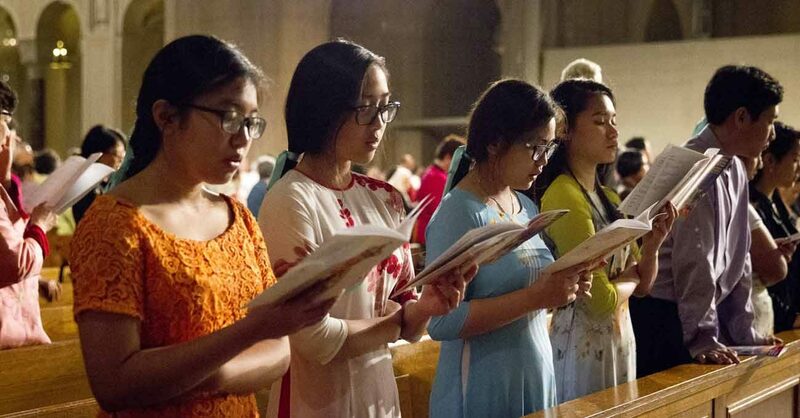 More than 1,000 pilgrims from Asian and Pacific Island Catholic communities filled the Basilica of the National Shrine of the Immaculate Conception May 6 for the annual Marian pilgrimage, a custom for the past 15 years. Cardinal Donald W. Wuerl of Washington welcomed the nationality groups and praised their popular devotions to Mary. He said the devotions showed the cultural richness, the value of diversity, and the harmony unique to cultural heritage. He praised the groups’ solidarity and eagerness to maintain customs and practices from their ancestors, as well as the focus on marriage, piety, respect for elders and the transmission of faith through culture. “What a blessing these gifts are in an increasing secular world we find ourselves immersed in today,” Cardinal Wuerl said during his homily. Before Mass, Flora Chow and her family crowned one of the statues of Mary at the shrine. She said that it had been an honor to do so because through Mary’s intercession, her family had received great blessings. When Chow’s daughter, Uriella, was 2, she had suffered a stroke. Chow credited prayer and devotions to Mary for Uriella’s physical improvement and for unifying family members who had let various disagreements keep them apart. Chow’s son Alex, 12, who placed the crown on the statue, said it was an honor for him and the entire family: “It meant a lot to us. She helped us grow as a family,” he said of Mary. Scalabrini Sister Myrna Tordillo, assistant director of Asian Pacific Islanders Affairs in the Secretariat for Cultural DIversity in the Church of the U.S. Conference of Catholic Bishops, said the occasion unites the wide array of Asian and Pacific Islander Catholic communities and Mary through a variety of popular devotions. Mary helps bring about unity, she said. The different communities demonstrate “a family togetherness,” Sister Tordillo said, as they experience joys, sorrows, pains, challenges and successes in unity. Maria del Mar Munoz-Visoso, secretariat executive director, thanked the congregation for instilling in the many children present the vitality of the popular devotions to the Virgin Mary.